I read this article and found it very interesting, thought it might be something for you. The article is called How A Spam Email Built A Google+ Community and is located at https://www.ben-johnston.co.uk/how-a-spam-email-built-a-google-community/. We’ve all had them – awful emails about guest posting services or link exchanges etc, but on Friday, I had one that was a little bit different. Well, I say one – by the time I woke up and checked my email from my phone, I had about fifty. 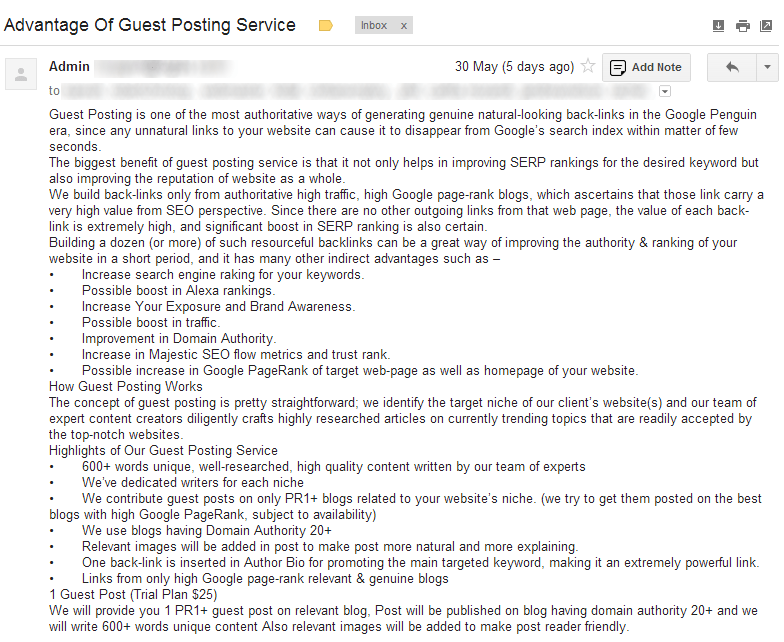 Here’s how it was: some genius guest-post-spammer actually sent their god-awful email (enlarge the pic to see how bad it is) to over 400 people and, rather than run it through some email marketing software like Mailchimp, they sent the message direct. All the email addresses were visible, too. That’s a big enough worry, but when a lot of people started hitting Reply to All saying “Remove me from your mailing list” or others saying “Stop hitting reply all”, things started to spiral. The number of emails I waded through on the train to work was monumental, and it continued throughout the day. 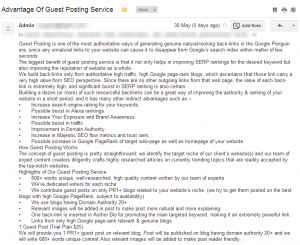 Amazingly, some people used it as an opportunity to hawk their own guest posting services, although I’m willing to lay money down to say that no one took them up on that. Around about lunchtime in the UK, some people started laughing about it and people started sharing their Google+ profiles, myself included. From this amateur spam came something of a camaraderie, a tribe if you’re down with Godin. I’ve now got about 30 people in my Circle entitled “THAT Spam Thread”, and the number’s still growing. I suppose that’s something that can be said about marketers – we never miss an opportunity to make some new connections. It also gave me the opportunity to play with my new toy called Outwit, which I used to pull all the Google+ URL’s into a spreadsheet and saved me a hell of a lot of time rather than just wading through all the emails or running a search. I daresay Outwit will be something that I’ll talk about a lot more on here at some point – it really is a great piece of kit. That’s the one learning I’ve got from this – well, that and don’t spam people. I’ve now got a load of new people sharing their content with me and I’m sharing with them too, and some of them have some really cool stuff to say. It might actually encourage me to use Google+ more, as well. Where did the emails come from? I’m suspecting the addresses were found through Blogger Linkup – I recently put a post out through there, and I’m pretty sure I’ve seen a couple of the other sites in the newsletter too. I’m not certain, but that’s how I think they got the email addresses. I’ve definitely had a lot more of this type of spam since I joined up. This was a fun little distraction, where quite a few people made a lot of new connections that they probably wouldn’t have done previously, but for the sake of my inbox, I really hope it never happens again. Ever.